This printed seventeenth century broadsheet held in the St George’s Chapel Archives and Chapter Library (SGC XI.H.11) describes the twists and turns of a long running legal dispute concerning Sir Francis Crane’s bequest to the Poor Knights of Windsor. From the reign of Elizabeth I, the Poor Knights had numbered thirteen, all of whom were accommodated in purpose built or adapted houses in the Lower Ward of the Castle. In the seventeenth century, the establishment was increased to eighteen under the terms of the wills of Sir Francis Crane and of his brother-in-law, Sir Peter le Maire. As a result of these bequests, five new almshouses were constructed against the lower east wall of the Castle, on the site now occupied by the nineteenth century guardroom. The five additional bedesmen who lived there and who were maintained by the bequests became known as the Poor Knights of ‘the New Foundation’ or ‘Crane’s Foundation’ or ‘the Lower Foundation’. The origins of Crane’s Foundation lay with Sir Peter le Maire who, by his will of 8 January 1631, left a legacy of £1,500 to his brother-in-law, Sir Francis Crane, to be applied to whatever charitable purposes he should think fit. Crane, at one time Chancellor of the Order of the Garter, decided to assign the benefaction to the Poor Knights of Windsor, providing accommodation and maintenance for two additional knights ‘of the foundation of le Maire’. He arranged for the construction of almshouses in the Lower Ward of the Castle and augmented the gift in his own will, dated 27 August 1635, providing for a further three Knights, bringing the total Poor Knights’ establishment to eighteen. In order to finance the construction and maintenance of the five extra houses and to provide an annual allowance of £40 to each of the five knights, Sir Francis Crane settled lands, including the manor of Carbrooke in Norfolk, to the value of £200 a year, with a further annual sum of £30 to be spent on the buildings. Sir Francis Crane died in 1636. 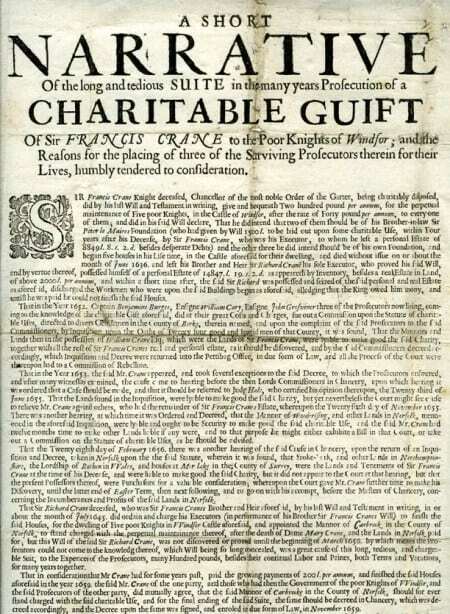 However the construction of the almshouses was brought to a halt shortly afterwards and the terms of the endowment became subject to a protracted series of law-suits, summarised in the contemporary broadsheet pictured above. Sir Francis’ brother and executor, Sir Richard Crane, had been negligent in his duties and when he, in turn, died in 1645 his son, William, disputed the gift. William lost his case in the King’s law courts and, in 1659, was ordered to pay the annual sum of £230 from Carbrooke manor: £200 to support the five Knights and £30 for the maintenance of the buildings, together with £1,000 of the arrears he owed. With the legal suit at an end, the almshouses were finally completed in 1659, three years after the appointment of the first ‘Poor Knights of Crane’s Foundation’ in 1656, and twenty-three years after the death of Sir Francis Crane in 1636. Sadly, Crane’s buildings were demolished in 1847 and Crane’s Foundation was absorbed into the main establishment in 1919, returning the number of Military Knights, as the Poor Knights had been known since 1833, to thirteen.